Rock n’ roll was more than a new kind of music, but a new story to tell, one for kids with transistor radios in their hands and money in their pockets, beginning to raise questions their parents never had the luxury to ask. Along with James Dean and J.D. Salinger and a handful of others in the 1950s, Chuck Berry – who was 90 when he died Saturday at his suburban St. Louis home – helped define the modern teenager. While Elvis Presley gave rock n’ roll its libidinous, hip-shaking image, Berry was the auteur, setting the narrative for a generation no longer weighed down by hardship or war. Well before the rise of Bob Dylan, Berry wedded social commentary to the beat and rush of popular music. “He was singing good lyrics, and intelligent lyrics, in the ’50s when other people were singing, ‘Oh, baby, I love you so,'” John Lennon once observed. 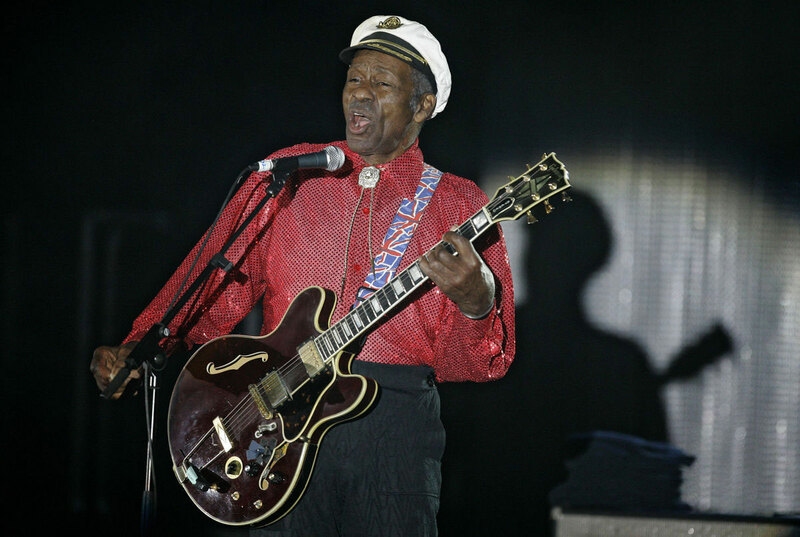 “Classic rock” begins with Chuck Berry, who had announced late last year that he would have a new album since 1979, called “Chuck,” sometime this year. His core repertoire was some three dozen songs, but his influence was incalculable, from the Beatles and Rolling Stones to virtually every garage band or arena act that called itself rock ‘n roll. In his late 20s before his first major hit, Berry crafted lyrics that spoke to young people of the day and remained fresh decades later. “Sweet Little Sixteen” captured rock ‘n’ roll fandom, an early and innocent ode to the young girls later known as “groupies.” ”School Day” told of the sing-song trials of the classroom (“American history and practical math; you’re studying hard, hoping to pass …”) and the liberation of rock ‘n’ roll once the day’s final bell rang. “Roll Over Beethoven” was an anthem to rock’s history-making power, while “Rock and Roll Music” was a guidebook for all bands that followed (“It’s got a back beat, you can’t lose it”). “Back in the U.S.A.” was a black man’s straight-faced tribute to his country, at a time there was no guarantee Berry would be served at the drive-ins and corner cafes he was celebrating. “Everything I wrote about wasn’t about me, but about the people listening,” he once said. The song was inspired in part by Johnnie Johnson, the boogie-woogie piano man who collaborated on many Berry hits, but the story could have easily been Berry’s, Presley’s or countless others’. Commercial calculation made the song universal: Berry had meant to call Johnny a “colored boy,” but changed “colored” to “country,” enabling not only radio play, but musicians of any color to imagine themselves as stars. Johnny B. Goode could only have been a guitarist. The guitar was rock ‘n’ roll’s signature instrument and Berry the first guitar hero. His clarion sound, a melting pot of country flash and rhythm ‘n blues drive, turned on at least a generation of musicians, among them the Stones’ Keith Richards, who once acknowledged he had “lifted every lick” from Berry; the Beatles’ George Harrison; Bruce Springsteen; and the Who’s Pete Townshend. Some stars covered him too well. The Beach Boys borrowed the melody of “Sweet Little Sixteen” for their surf anthem “Surfin’ U.S.A.” without initially crediting Berry. The Beatles’ “Come Together,” written by Lennon, was close enough to Berry’s “You Can’t Catch Me” to inspire a lawsuit by music publisher Morris Levy. In an out of court settlement, Lennon agreed to record “You Can’t Catch Me” for his 1975 “Rock n’ Roll” album. Berry himself was accused of theft. In 2000, Johnson sued Berry over royalties and credit he believed he was due for the songs they composed together over more than 20 years of collaboration. The lawsuit was dismissed two years later, but Richards was among those who believed Johnson had been cheated, writing in his memoir “Life” that Johnson set up the arrangements for Berry and was so essential to the music that many of Berry’s songs were recorded in keys more suited for the piano. He received a Grammy for lifetime achievement in 1984 and two years later became a charter member of the Rock and Roll Hall of Fame, along with Presley, Buddy Holly, Little Richard and others. In the 1990s, Berry began giving monthly concerts in the intimate setting of the “Duck Room” of the Blueberry Hill club in St. Louis, drawing visitors from around the world. At times he was joined by his son, guitarist Charles Berry Jr., and daughter, Ingrid Berry Clay, on vocals and harmonica. He married their mother, Themetta Suggs, in 1948. They had four children. Charles Edward Anderson Berry was born in St. Louis on Oct. 18, 1926. As a child he practiced a bent-leg stride that enabled him to slip under tables, a prelude to the trademark “duck walk” of his adult years. His mother, like Johnny B. Goode’s, told him he would make it, and make it big. He began his musical career at age 15 when he went on stage at a high school review to perform a cover of Jay McShann’s “Confessin’ the Blues.” Berry would never forget the ovation he received. Influenced by bandleader Louis Jordan and blues guitarist T-Bone Walker among others, hip to country music, novelty songs and the emerging teen audiences of the post-World War II era, Berry signed with Chicago’s Chess Records in 1955 after hooking up with Johnson three years earlier. “Maybellene” reworked the country song “Ida Red” and rose into the top 10 of the national pop charts, a rare achievement for a black artist at that time. According to Berry, label owner Leonard Chess was taken by the novelty of a “hillbilly song sung by a black man,” an inversion of Presley’s covers of blues songs. Several hits followed, including “Roll Over Beethoven,” ”School Day” and “Sweet Little Sixteen.” Among his other songs: “Memphis,” ”Nadine,” ”Let it Rock,” ”Almost Grown” and the racy novelty number “My Ding-A-Ling,” which topped the charts in 1972, his only No. 1 single. Berry didn’t care for hard drugs and spoke of drinking screwdrivers “without the driver.” But he knew too well the outlaw life. His troubles began in 1944, when a joy riding trip to Kansas City turned into a crime spree involving armed robberies and car theft. Berry served three years of a 10-year sentence at a reformatory. In the early 1960s, his career was nearly destroyed when he was indicted for violating the Mann Act, which barred transportation of a minor across state lines for “immoral purposes.” There were two trials: the first so racist that a guilty verdict was vacated, and the second leading to prison time, 1 1/2 years of a three-year term. Berry continued to record after getting out, and his legacy was duly honored by the Beatles and the Stones, but his hit-making days were essentially over. “Down from stardom/then I fell/to this lowly prison cell,” Berry wrote in his journal as his jail time began. Tax charges came in 1979, based on Berry’s insistence he receive concert fees in cash, and another three-year prison sentence, all but 120 days of which was suspended. Some former female employees sued him for allegedly videotaping them in the bathroom of his restaurant. The cases were settled in 1994, after Berry paid $1.3 million. Openly money-minded, Berry was an entrepreneur with a St. Louis nightclub and, west of the city, property he dubbed Berry Park, which included a home, guitar-shaped swimming pool, restaurant, cottages and concert venue. He declined to have a regular band and instead used local musicians, willing to work cheap, wherever he performed. Springsteen was among those who had an early gig backing Berry. Berry and his duck walk were seen in several teen exploitation flicks of the ’50s. In the 1980s, Richards organized the well-received documentary “Hail! Hail! Rock ‘n’ Roll,” featuring highlights from concerts at St. Louis’ Fox Theatre to celebrate Berry’s 60th birthday that included Eric Clapton, Little Richard and Jerry Lee Lewis, who recalled being told by his own mother that Berry, not he, was the true king of rock ‘n’ roll. Berry also was the subject of countless essays and histories of rock music, but he was his own best biographer. In “Go, Go, Go,” one of many songs to feature Johnny B. Goode, he celebrates his magic on stage, an act irresistible to young and old, boy and girl, dog and cat.